In February we ran our 3-day Hearing Voices Facilitation course from Manchester for the first time. We had twenty trainees from HMP Wakefield, HMP Berwyn, HMP New Hall, St George Healthcare Group, HMP Garth, HMP Haverigg, HMP Hindley, HMP Wealstun & Arbury Court Forensic Hospital. Staff from HMP Berwyn in Wales (which when fully operational will be the largest prison in Europe!) have been in touch to say they are progressing well with laying the foundation for their Hearing Voices Group launch. Since the training, HMP Garth’s Beacon Unit, part of the National Offender Personality Disorder Strategy, have been in touch to organise further training. We shall be developing the Voices Unlocked network across the North of England next year, using Manchester as our Northern base. In February, one of our development workers presented at the Oxford Migration Studies Society about the work that Voices Unlocked does in Immigration Removal Centres. The talk gave an introduction to ‘Hearing Voices’, presenting the Hearing Voices Approach and explaining how it differs from the mainstream bio-medical approach. It then moved on to discuss Hearing Voices in spaces of detention, and Immigration Removal Centres more specifically. In the Q&A/discussion, students expressed their curiosity about the effects of detention on mental wellbeing. 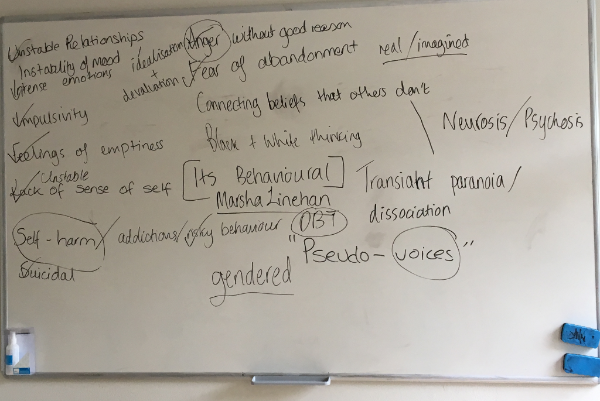 They explained that because they had mainly learned about detention from more abstract political and sociological perspectives, they hadn’t thought so much about the pressures and stresses that individuals in detention are likely to experience. They reflected on how the high levels of uncertainty in Immigration Removal Centres – where, unlike prison, there is no limit to the duration of detention, or known outcome of detention – must be unbearable to live with. We also had an interesting discussion about ‘intersectionality’ – the overlapping effects of the different categories by which a person is defined. We talked about the intersection of citizenship status (citizen vs non-citizen), race, gender, and mental health status. We look forward to future discussions with OMSS! In December we wrote about the workshops for prisoners at HMP Huntercombe, a foreign national prison in Oxfordshire. They now have launched their men’s weekly Hearing Voices Group and we’ve heard it’s going well. Since the launch, we’ve had a member of their staff on our one-day Hearing Voices Awareness training. Hopefully, we’ll be able to train more of their staff in group facilitation in the near future. We shall stay in contact with Huntercombe, providing support for the group’s ongoing development. Voices Unlocked’s Hearing Voices Group Facilitation Training fills up within a week! We have just announced our summer Voices Unlocked 3-day Group Facilitation Training and are already full to capacity! We no longer have to do much advertising for the courses, tickets were available for just over a week before we became fully booked. Held over the 30th, 31st May & 6th June 2018, the training is open to people across the country who would like to develop Hearing Voices Groups in secure settings (we hold separate training for people setting up women-only groups). The course is free for those committed to facilitating a men’s/mixed Hearing Voices Group within a prison, IRC, medium or high secure unit. Please email Jessica Pons if you would like to be made aware of the next facilitation course.